It is important to lay a foundation that will help you think about what principles will guide your decision making and help you set priorities. Nursing homes are complex organizations, with numerous departments performing different functions that interact with and depend on each other. Establishing a purpose and guiding principles will unify the facility by tying the work being done to a fundamental purpose or philosophy. These principles will help guide your facility in determining programmatic priorities. 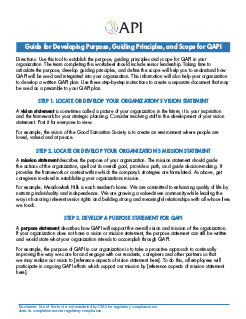 Use the Guide for Developing Purpose, Guiding Principles, and Scope for QAPI to establish the principles that will give your organization direction. The team completing this assignment should include senior leadership. Taking time to articulate the purpose, develop guiding principles, and define the scope will help you to understand how QAPI will be used and integrated into your organization. This information will also help your organization to develop a written QAPI plan. Directions: Use this tool to establish the purpose, guiding principles and scope for QAPI in your organization. The team completing this worksheet should include senior leadership. Taking time to articulate the purpose, develop guiding principles, and de ne the scope will help you to understand how QAPI will be used and integrated into your organization. This information will also help your organization to develop a written QAPI plan. Use these step-by-step instructions to create a separate document that may be used as a preamble to your QAPI plan. A vision statement is sometimes called a picture of your organization in the future; it is your inspiration and the framework for your strategic planning. Consider involving staff in the development of your vision statement. Post it for everyone to view. For example, the vision of the Good Samaritan Society is to create an environment where people are loved, valued and at peace. A mission statement describes the purpose of your organization. The mission statement should guide the actions of the organization, spell out its overall goal, provide a path, and guide decision-making. It provides the framework or context within which the company's strategies are formulated. As above, get caregivers involved in establishing your organizations mission. For example, Meadowlark Hills is each resident's home. We are committed to enhancing quality of life by nurturing individuality and independence. We are growing a value-driven community while leading the way in honoring inherent senior rights and building strong and meaningful relationships with all whose lives we touch. A purpose statement describes how QAPI will support the overall vision and mission of the organization. If your organization does not have a vision or mission statement, the purpose statement can still be written and would state what your organization intends to accomplish through QAPI. For example, the purpose of QAPI in our organization is to take a proactive approach to continually improving the way we care for and engage with our residents, caregivers and other partners so that we may realize our vision to [reference aspects of vision statement here]. To do this, all employees will participate in ongoing QAPI efforts which support our mission by [reference aspects of mission statement here]. Guiding Principles describe the organization's beliefs and philosophy pertaining to quality assurance and performance improvement. The principles should guide what the organization does, why it does it and how. Guiding Principle #1: QAPI has a prominent role in our management and Board functions, on par with monitoring reimbursement and maximizing revenue. Guiding Principle #2: Our organization uses quality assurance and performance improvement to make decisions and guide our day-to-day operations. Guiding Principle #3: The outcome of QAPI in our organization is the quality of care and the quality of life of our residents. 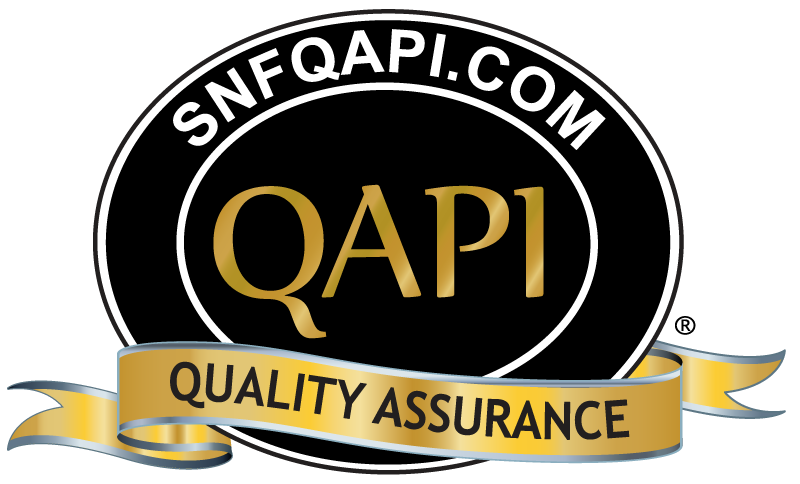 Guiding Principle #4: In our organization, QAPI includes all employees, all departments and all services provided. Guiding Principle #5: QAPI focuses on systems and processes, rather than individuals. The emphasis is on identifying system gaps rather than on blaming individuals. Guiding Principle #6: Our organization makes decisions based on data, which includes the input and experience of caregivers, residents, health care practitioners, families, and other stakeholders. Guiding Principle #7: Our organization sets goals for performance and measures progress toward those goals. Guiding Principle #8: Our organization supports performance improvement by encouraging our employees to support each other as well as be accountable for their own professional performance and practice. Guiding Principle #9: Our organization has a culture that encourages, rather than punishes, employees who identify errors or system breakdowns. Add any additional Guiding Principles that may be important to your nursing home. Review the ve QAPI elements to ensure you identify and capture guiding principles for your organization. The Scope outlines what types of care and services are provided by the organization that impact clinical care, quality of life, resident choice, and care transitions. Be sure to incorporate the care and services delivered by all departments. Once the list of care and service area has been identi ed, you can determine how each will use QAPI to assess, monitor and improve performance on an ongoing basis. Once you’ve completed steps 1-5, assemble the vision and mission statements, guiding principles, and scope of QAPI into a separate document that may be used as a preamble to your QAPI plan. This document will help you articulate the goals and objectives of your organization; QAPI will help you get there. Consider posting for all to see. The next step is to develop a written QAPI plan that will meet your purpose, guiding principles and comprehensive scope described above. See "Guide for Developing a QAPI Plan."